Brighten up the look of your late model Jeep Grand Cherokee and help maintain its new and scratch-free appearance with Illuminated Door Sill Guards available at JustforJeeps.com. Don't let your interior door sills get scuffed up when you can keep your vehicle looking as new and as free from blemishes as possible. 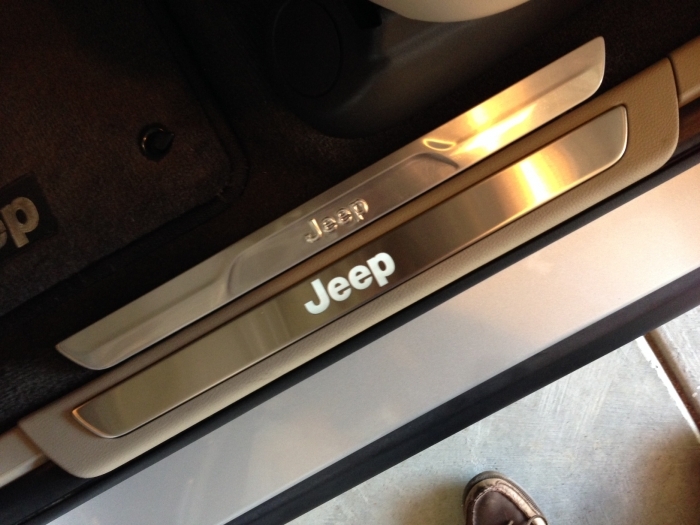 Two front sills come with each set and feature the illuminated logo of Jeep. 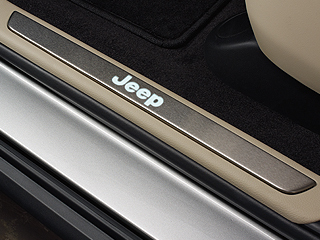 The Illuminated Door Sill Guards are made of brushed stainless steel, and the illuminated feature will make your sills sparkle. 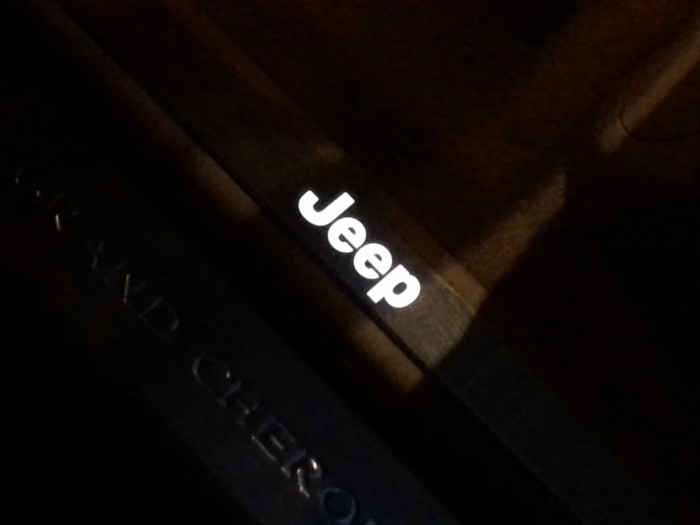 Comes as a set of two front sills with illuminated Jeep logo. This is a subtle by nice improvement to the Grand Cherokee, and something a high-end vehicle should have standard. The sills have gone from barely noticeable to aesthetically pleasing. At night the LED-based illumination looks very nice. During daylight the larger and more prominent Jeep logo looks nice. The installation instructions (from Mopar) are sufficient, but not great. The wrong size ratchet is specified (easily resolved), the recommended technique for connecting the wires is overly complex (did it a simpler way), and the don't actually test the connection until everything is put back together (a smart person tests early and often). But all things considered the installation is fairly straight-forward, and rewarding. ProsLooks nice in daylight and darkness. Easy enough installation. ConsInstallation instructions are not great. Classy upgrade for a classy SUV! Very high quality and heavy weight peice of brushed stainless is the foundation for this part, it is beautiful on its own. Then add the subtle backlit white light and you will be waiting for the sun to go down just so you can see the your handy work. Bring that cool factor up a notch and add a set of these to your WK2. ProsVery Simple installation, with straight forward instructions. There is plenty of wire if you want to run the harness along the other harnesses under the carpet for a cleaner install. ConsIf you have a laredo with black interiour your can buy the limited scuff plates to do this mod, but If you have a Laredo with greystone (D3) interiour you will have to be handy with a router or a grinding bit, to make these work. Easy to install , in an hour i was done. Looks pretty good, shipping was quick also! I purchased this item for purely cosmetic purposes since I really liked the way the look, and imagine they will look against my all black interior Grand Cherokee. The item arrived in excellent condition and was well packaged. However, I can't attest to functionality yet because I haven't had them installed. Install was pretty straight forward,except they left one step out.You have to drill a hole to get the wire through the sill backing to run it across the jeep,otherwise people will see it.Other than that anyone can do this install just read the directions and take your time.Also i didnt remove the panels next to the sills,i just pushed the wire under them,they have play in them. ConsThey scuff easily,but its not a spot that people step on unless you have kids under 11.I can see them stepping on it. Was fairly easy to install and sure stands out when entering. Very glad I did this! 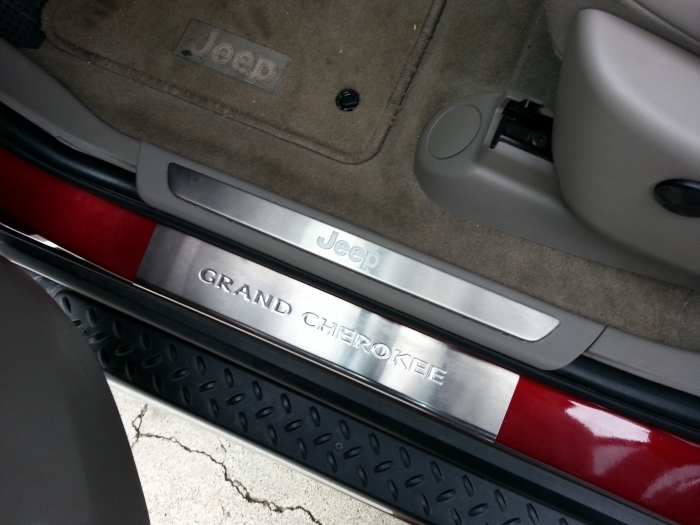 Nice accessory for a Grand Cherokee. Fast delivery and great customer service. Thanks "Just for Jeeps"! Great looking and very easy to install. This was a surprise for the wife who likes the lighted door sills on our Mercedes. She loved them. It adds a nice touch and they are very easy to install. The instructions were easy to follow. ProsEasy to install Looks great Steps up the look, no pun intended.